It's been weeks since the news came out that the Washington Redskins were not going to sign Kirk Cousins to a long-term deal. I'm still in shock. Cousins has finished in the top-14 of both passing yards and passing touchdowns, doing all this with limited weapons. His weapons weren't bad, by any means, but he lacked a true WR1 and Jordan Reed was rarely on the field. A big place where Cousins was hurt was inside the red zone. Considering his main 3 receivers were 6"0 or under, it's understandable that his completion percentage was under 50% and his rating was under 85. Now, it's all flipped around and Cousins is locked and loaded for an elite season. The Redskins retooled the receiving core this season, adding Terrelle Pryor and releasing DeSean Jackson and Pierre Garcon. It's a whole different style, especially because Josh Doctson is healthy. They went from pass catchers with high YAC ability to a duo who can go up and get the football. The thing is, they still have Jamison Crowder, who's similar to Pierre Garcon and will handle the slot. They also added an agile pass catching back in the draft (Samaje Perine ) that people have raved about in the offseason. Cousins is a consistent producer. Finishing as the 2016 QB5, he scored at least 20 fantasy points in all but 4 of his games last year. For reference, both Matt Ryan and Tom Brady only failed to score 20+ 3 times each last year. Back to back years, he hasn't missed an NFL game. He also did not have a game last year with over 2 interceptions. When healthy, Jordan Reed is one of the best tight ends in the league. Last year, he ranked 2nd in the league in fantasy points per game. He's similar to Rob Gronkowski. When he saw 10+ targets, he always converted, eclipsing 10 standard fantasy points most times he saw plenty of targets. Cousins and Reed have a healthy connection, as was evident on Thanksgiving in their game against Dallas. Let's go back to the receivers for a second. From a size and speed standpoint, you aren't finding a better duo than Terrelle Pryor and Josh Doctson. Two fast receivers over 6"2? Yes please. Cousins posts his best numbers in the short game, so Pryor and Doctson will help Cousins a ton in the deep game. As I already stated, the touchdown numbers (25 in 2016) are what's holding Kirk back from a truly elite season. New weapons combined with inevitable improvement, I'm expecting a 35 touchdown season from Cousins. We've seen the upside Cousins has. In the final 9 games of last year, Cousins was a QB1 every single week. Keep in mind, this is really when all of his weapons were on the field together. Cousins really started to shine and ended the year on a good note after getting off to a somewhat slow start. Cousins, without question, still has room to grow. I definitely think we're seeing improvement in 2017, which could very well push him into an elite season. Washington not being able to commit to Cousins will light a fire under him. I don't like to be cheesy and count on these things, but improvement is coming for Cousins. It's been two straight years that we've seen talented QB's really take a step up and become elite. Why not Cousins this year? He's improved every year and has extremely talented weapons. 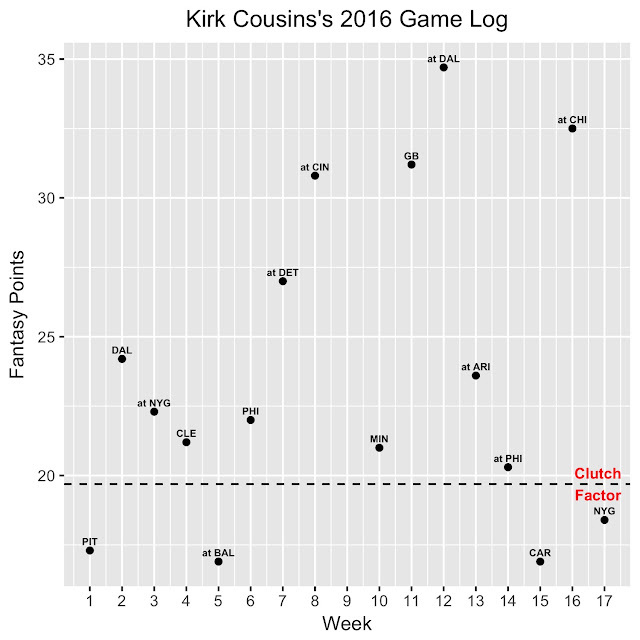 As for fantasy, Cousins is the ultimate value pick (8.09) and should be targeted in all of your leagues.